Press Sample Although I said that I would be back with a vengeance, I’m already back to my routine of late night blogging. But at least I’m getting a post up today right? 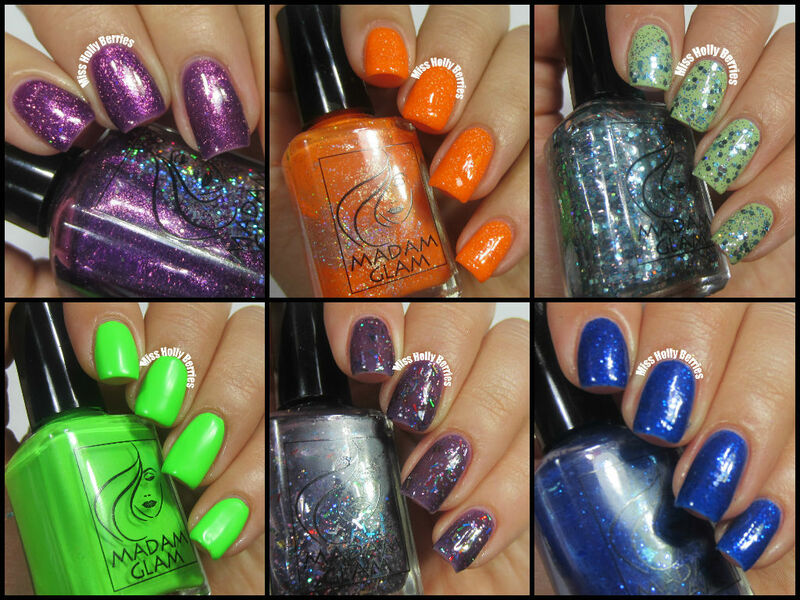 Well, today’s blog post is all about Madam Glam polishes. I have to be honest, I had never heard of Madam Glam until a company I had worked with previously for my YouTube channel (Irresistible Me Hair Extensions) informed me that they had a sister company devoted to polish. I was a little weary of a hair extension company recommending me nail polish but after looking through their website, I saw a few “me” colors and decided to give these babies a shot. I have 6 of their core colors to share with you guys today but I first wanted to talk about the packaging. The packaging is your standard square glass bottle but the bottle is a little thin. You can tell that the glass is thin because you can very clearly hear the small metal balls in the bottle rattling around. So be careful when it comes to storage as to not break these. Now onto the colors! Petunia is a warm medium toned purple microglitter in a purple base with small holographic glitters. I had such high hopes for this polish. While it is gorgeous, the holographic glitter completely sunk to the bottom. I tried shaking it a ton and even stored it upside down for a few minutes, but alas, no holographic glitter. I got a few pieces to apply to the nail but not enough to make it noticeable even in my photographs. This is 2 coats. It Girl is a bright orange jelly with holographic glitter. This polish definitely is bright and is currently sitting next to Orly “Melt my Popsicle” on my desk and is almost as neon as that eye-searing orange. So I’m comfortable calling this an almost neon shade. And unlike its sister polish Petunia, the holographic glitter actually shows up! I wish I had taken a blurry picture to show the glitter, but it is really apparent in real life and so gorgeous. But because its a jelly, it’s sheer. This is 3 coats. Over the Rainbow is a teal hex glitter with blue and salmon micro glitter in a clear base. I don’t really understand the name considering that there aren’t too many colors in this polish but I am definitely impressed. This is just one coat without any dabbing or manipulating to get an even coverage. Maybe not as unique as It Girl but a great polish nonetheless. Again, what is with these names?! Mint Cocktail definitely isn’t mint but is an super bright neon lime green cream. This is my favorite of the 6! It’s the summer so I’m on a neon kick at the moment, but this is a true neon lime green. And unlike other limes I have, this is almost opaque in 1 coat! This is 2, but I’m currently wearing this and I definitely did get away with just 1 coat on a few nails. So there isn’t the need to layer this over white, because it is the most opaque neon I’ve ever tried. With that being said, it is a very thick formula (but not unmanageable). If you thin it out, it would need 2 coats. 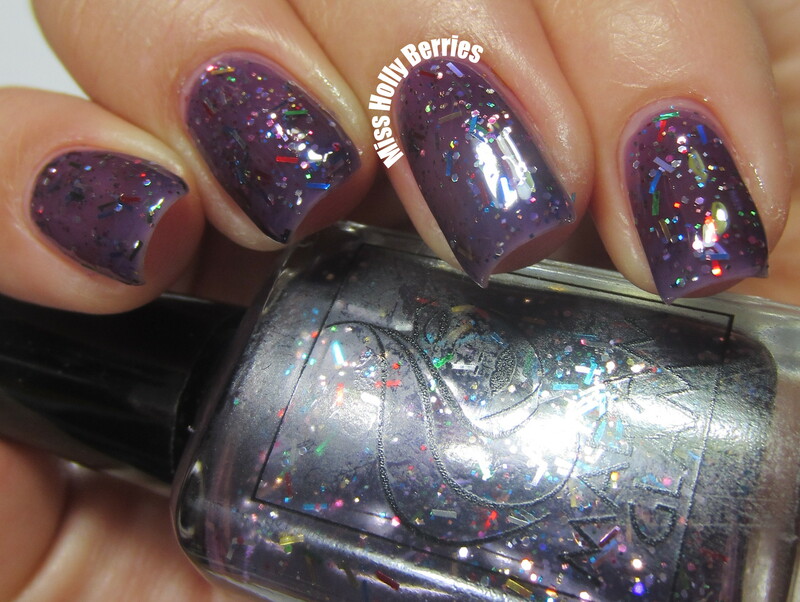 Fruit Cocktail is a sheer dark purple jelly with holographic glitter and red, silver, blue green and gold bar glitter. Judging from the website, I had no idea that this had bar glitter in it. I’m not the biggest fan of bar glitter, but the combination is kind of cool. This is super sheer! This is 3 coats and it still isn’t opaque. I think this would be better as a layering polish, but then you lose that depth that jellies create. 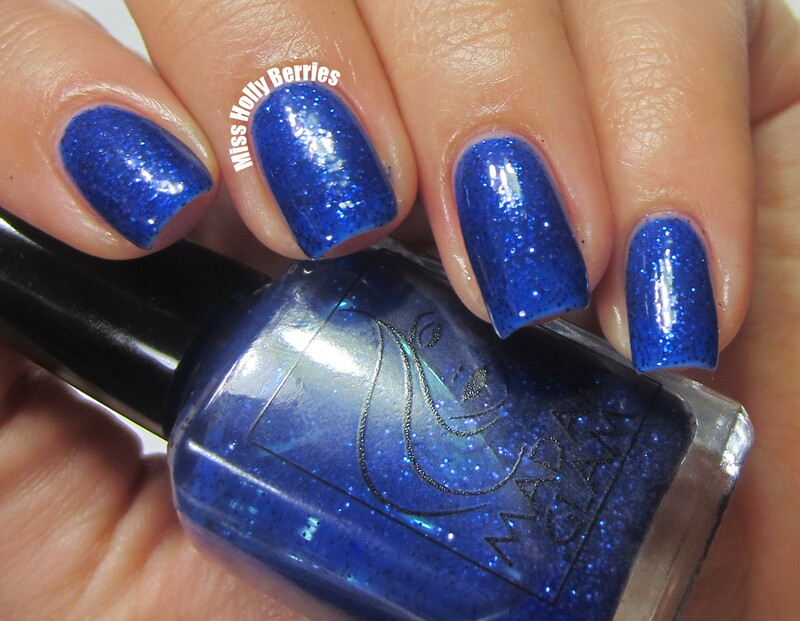 Pop My Night is a cerulean blue jelly with blue micro glitter. Cerulean blue is my all time favorite shade of blue so I knew before I applied this that I was going to love it. The finish kind of reminds me of a bowling ball that is a rich color but has all that sparkle and glitter. This is also pretty sheer. This is 3 coats and I can still see VNL so this also may be better as a layering polish. But I do love this color! I can never get enough. Overall, these were kind of hit and miss for me. I LOVE Pop My Night, Mint Cocktail and It Girl, and would definitely recommend those 3. However, I had issues with Petunia and Fruit Cocktail. You can find the full line at the Madam Glam Website. You can also check them out on all their social media sites! ← Where the H*LL Have I BEEN!? !